I love talking about travel and I’m not shy! I’ve spoken at writers’ conferences, travel shows, and travel industry gatherings. I’ve also conducted workshops for travelers, and for ten years I taught travel writing at the University of California San Diego. I’m very comfortable being interviewed on a wide variety of travel topics, and I really enjoy interacting with fellow travelers and travel industry colleagues. The Gathering Road on the Women’s Radio Network: I’ve done lots of radio interviews. They’ve all been fun, but I especially enjoyed this one about authentic luxury travel. Host Elaine Masters asked all the right questions and skillfully guided the conversation. San Diego Travel & Adventure Show: It was fun being the emcee at the San Diego Travel & Adventure Show at the San Diego Convention Center . I had an on-going conversation with the audience, and I introduced The Travel Channel’s Samantha Brown and Don Wildman, as well as Leo Logothetis, Patricia Schultz, and Jorge Meraz. SD TravFest: At this great event, I spoke to an enthusiastic audience about “How to Deeply, Personally, Authentically Cross-Culturally Connect.” It was a real joy to share my thoughts on this topic because Authentic Luxury Travel is the focus of my writing life. My presentation was based on my 12-step program for tourists who want to be real travelers, and I also touched on ways to make trips more meaningful by including voluntourism experiences. PATA, San Diego chapter: I was happy to suggest a speaker for a recent SAN PATA meeting. Over the years, I’ve made many valuable travel connections online. Of these, Van Nguyen is one of the most significant. Our friendship grew out of a discussion about luxury travel in a LinkedIn group. 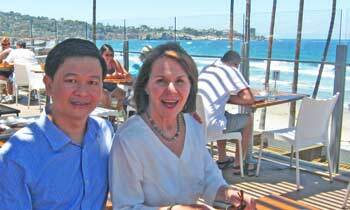 We recently met face-to-face for the first time when he visited the U.S. to promote his business Vietnam Alive. It was my great pleasure to introduce him at the meeting.